Drs. Stuart Hirsch and Magdalene Concha from NYU consult over the best treatment course for one patient. New York University's College of Dentistry operates outreach programs that routinely send its dental interns to far-off locales such as Sri Lanka, Nepal and Cambodia. But last week, the 40-member team returned to Maine's Washington County, where financial and transportation barriers prevent many Down East families from obtaining much needed dental care. 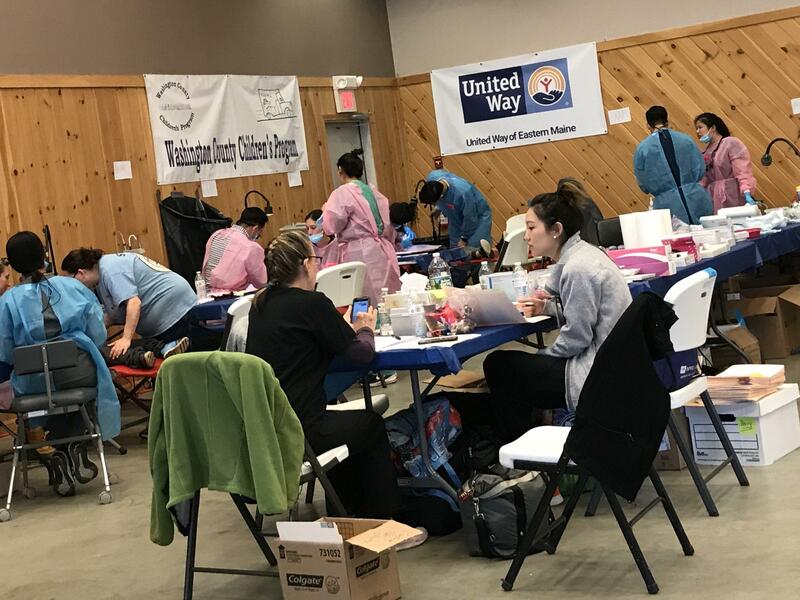 Working with major stakeholders such as Northeast Delta Dental and regional health care organizations, the NYU students treated about 550 children and adults during their weeklong stay in Machias. 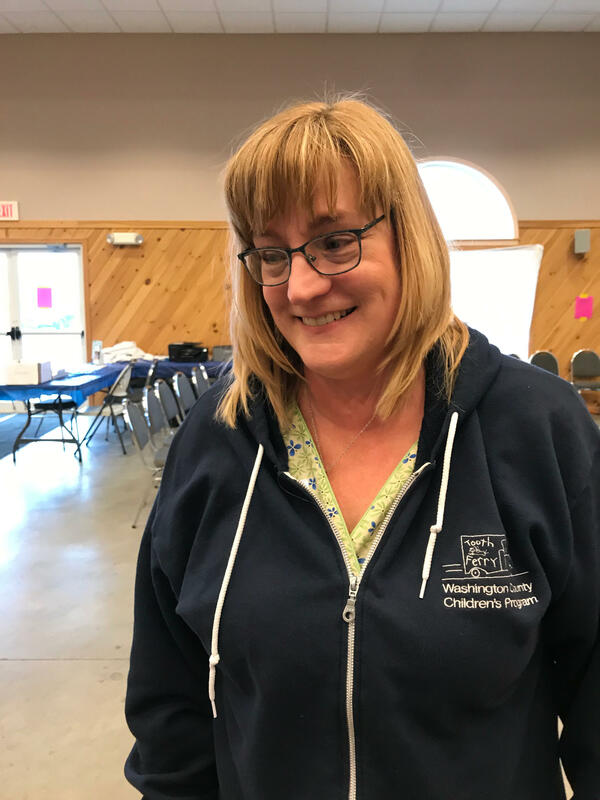 Children and adults began arriving at the Lee Pellon Event Center in Machias an hour before the NYU dentistry students and faculty opened their free clinic in the 60-by-60-foot room. One half of the space was dedicated to pediatric dental services while the other was reserved for those requiring more serious procedures such as extractions and root canals. At the Lee Pellon Event Center in Machias, NYU College of Dentistry students examined the the mouths of hundreds of children last week during a free examination clinic. Teresa Alley, the oral health coordinator for the Washington County Children's Program, has watched NYU's Machias clinic expand over the last nine years. But while Alley has seen the levels of tooth decay decline among the clinic's returning patients, she says continuity of care remains a major issue in Washington County. "There are seven dentists in Washington County and we have a population of about 33,000," Alley said. "We've had two dentists in the last two years retire. So, this is the fewest amount of dentists that we've had." Alley says many of the patients who visited the Machias clinic last week might not see a dentist again for another year. Still, that's better than where many Washington County residents were in 2010, when the NYU dentistry students first started visiting the region. At that time, Alley said tooth decay rates were running as high as 45 percent for many of the children visiting the clinic. She says that decay rate is now down to less than 20 percent among the returning patients. Alley says her recent conversation with a young boy experiencing dental pain is pretty typical of many Washington County families. "And what he told me was, 'Mom says we can go to the dentist when we get a new wheel on the car.' So how do you deal with that? How do you know that this situation is happening and how do you go to the next level to help?" Alley said. "We will see about 1,000 children in a year and that story is true for many children — it isn't just this one child." Like other Washington County moms, Erika Robinson of Jonesport packed her two sons off to see the NYU dentists. And if her daughter hadn't contracted a cold, she would have brought her too. Robinson says it's hard for many parents in the county to even enter into a working agreement with some area dentists. "No one does like payment plans. There's very few sliding scale fees, and even those are really expensive sometimes," Robinson says. "So this is a really great opportunity to get the kids looked at — even for yourself." The NYU dental students have experience working in a number of other countries where dental services are scarce and poverty rates are high. In that respect, dentist Magdalene Concha says Washington County is similar to rural areas near her hometown of Santiago, Chile, especially when it comes to the centralization of professional services in large cities. "It is interesting to see that, even though I'm from Chile very far away from here, we face some things that are in common," Concha said. "Everything is centralized in the big cities there and all the rural areas are out of resources." Concha and Dr. Stuart Hirsch, vice-dean of international initiatives for the NYU College of Dentistry, consult over a patient who will require some fillings. Later, Hirsch says he has enjoyed bringing accessible dental health care to Washington County, but he continues to worry about the availability of dental services in one of the state's poorest and remote regions. "It's not exactly a place that dentists flock to," Hirsch said. "It's financial issues that exist. And the number of people who can afford to have care at private dentists that don't accept Medicaid is a limited number." According to the America's Health Rankings group, Maine's rate of a little more than 50 dentists per 100,000 residents in 2018 lags behind the national average of 61 dentists per 100,000. Originally published April 16, 2019 at 3:26 p.m. ET.